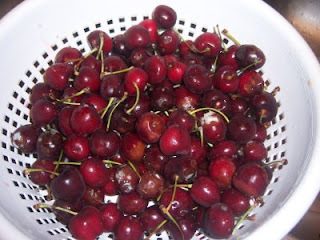 green pickle: life is just a bowl full of cherries???? 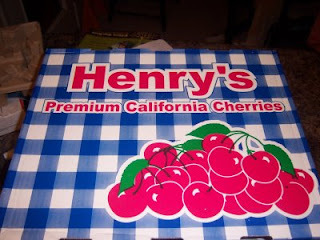 Well you can also get extra yummies, and this last week I bought a 16 lbs box of cherries for $14.50, which is about 90 cents a lbs. great deal.....IF..... you have time to do something with them. I mean after you have eaten your fill. Its not such a great deal if you leave to go camping and come back to about half of them moldy....NO NOT MOLDY CHERRIES... so when i got back, I had to try and salvage what was left and sit for hrs and pit them and put some in the freezer(for cobblers later on) and dried the rest in the dehydrator. So much for a great deal....here is a great (sort of secret ) super easy cobbler recipe that you can use any fruit. My mom taught me how to make this and its been a favorite of mine.... i mean i could eat the whole pan. The name officially is Lazy Women's Pie..... although we changed the name to Busy Women's Pie.... I mean who's lazy around here, anyway??? So, heat your oven to 350 and get out your 9x13 baking dish, and melt 1 cube (I will be taking a poll on this later) butter in the oven while your mixing up 1 cup flour, 1 cup sugar, 1 1/2 tsp. baking powder, 1 tsp cinnamon, and 1/2 cup milk..... OK then after the butter is melted(be careful not to burn the butter) then dollop the mixture in the butter, it won't cover the bottom, but its OK just dollop it around, then take 3-4 cups of fruit(you can sweeten it with honey or sugar, if its not real sweet fruit) then dump that on top and bake at 350 for about 35-40 minutes.... and you can serve with vanilla ice cream or whipped cream.... this is so good!!!! try no to eat the whole thing...share, I know its hard!!!! sorry, I do not have a picture of the busy women's pie.... We ate it!!! you will just have to make it yourself!!! ok so I am very curious to know how many people say a cube of butter or a stick???? I have always said cube, probably because that is what my mom always says, but its not really a cube, its more of a rectangle... any way is it a regional thing... let me know what you call it!!! Bummer about the cherries, I just had to throw out three pineapples so I feel your wasted fruit related pain! !